The Rain Tee collection is a thoughtful and truly unique children’s and women’s clothing line that ECOBAGS® is proud to begin working with. Beth Doane started the collection by donating school supplies to children in endangered rain forests and asking them to illustrate what they saw happening around them. For each Rain Tee sold, a tree is donated to youth involved in environmental education in Costa Rica. Beth and her Rain Tees! The collection features all organic cotton T-shirt’s printed with bright, colorful, youthful designs. 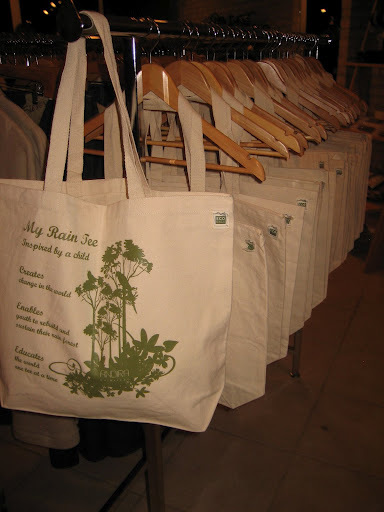 We are so excited that Rain Tees has recently added organic cotton ECOBAGS to their line! We love working with customers who have found innovative ways to create positive change in the world. Hats off to Rain Tees! Keep fighting the good fight eco-friendly folks! Bit by bit we can make a difference. FYI I work for an eco-friendly promotional products manufacturer and encourage everyone to take a look. We can, and will, make a difference.